Figures from the latest Active Lives Adult survey released today (11 April) has shown an encouraging trend in the activity levels of adults. Since the first results were published for November 2015/16, there has been a significant decrease in the number of inactive adults in West Yorkshire, alongside an increase in the adults meeting the Chief Medical Officer’s guidelines of doing at least 150 minutes of moderate intensity physical activity a week. 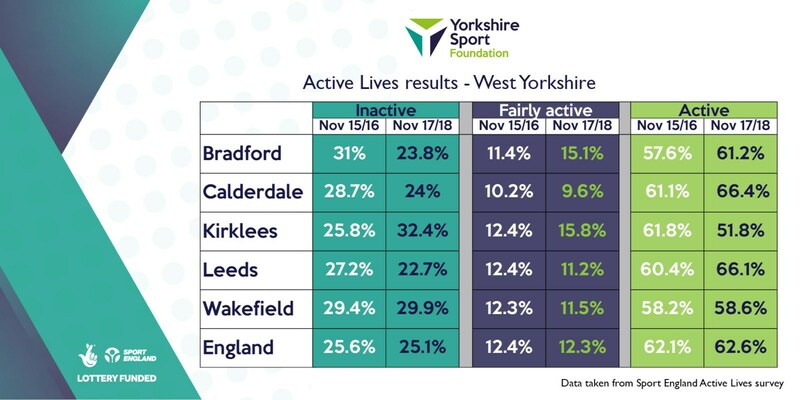 Bradford, Calderdale, Leeds and Wakefield have all shown notable increases in the number of active adults, meaning increased numbers of people experiencing the benefits to their physical and mental wellbeing that being active brings. Sheffield is the district with the most active people in South Yorkshire, comfortably above the national average. There has been a small increase in the number of inactive people in the county, but three of the four districts have shown an increase in those classed as ‘fairly active’. Across England, there has been an increase in the numbers of active people, and a decrease in the number of people classed as inactive. Nationally, the number of active women has risen, meaning the gender gap between numbers of men and women who are physically active, is continuing to narrow. Figures also show an increase in the number of disabled people and those with long-term health conditions classed as active – the first increase in this category since the 2012 Olympic and Paralympic Games. Retired people are also getting active, with retirees specifically leading to a decrease in the number of 55+ adults classed as inactive. 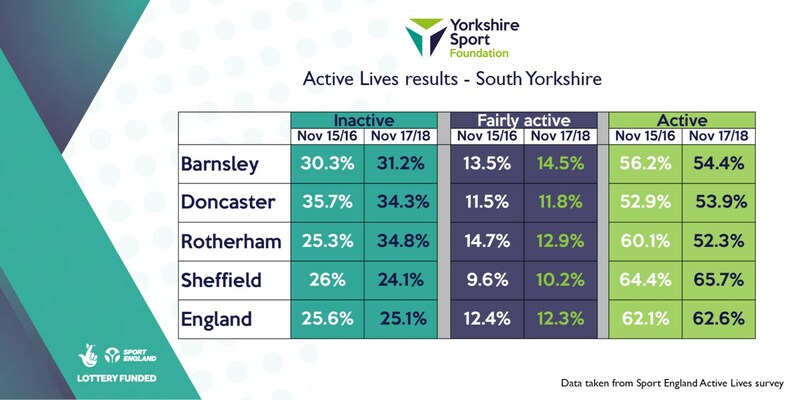 Nigel Harrison, Chief Executive of Yorkshire Sport Foundation, commented: “We’re encouraged by the trend of fewer inactive people, with significant improvements in districts like Bradford, where Active Bradford, a partnership of local agencies, is starting to make an impact on local strategies and policies. “We know that people are generally aware of the need to be active, but for a number of different reasons find it difficult to be so. We need agencies and communities to work together to find ways to make physical activity a normal part of everyday life. There are now partnerships in each of our districts that are starting to make this happen, and we’ll continue to connect and influence to make these a success. “Today’s results do, however, continue to reminds us of the challenge we have of encouraging people to be active. Over a quarter of our population are classed as inactive but we know these figures hide the true picture in some of our communities where local research has shown that being inactive is much more of the norm. For the full Active Lives reports, click HERE. We will be delving deeper into the data over the next few weeks, and sharing findings at a district level with our partners.